He's sketching as he sits on the patio of the coffee shop. All types of people, especially pretty young women, gravitate to him. He's describing his work, sharing stories of his past, discussing science, television, rock music, and an unlimited range of other topics. Christopher Canole appears like a modern-day troubador, but with a sketch-pad and pencil in place of a lute. Each line he sketches runs onto the paper like a note into a song, or as he puts it, like a line of dialogue into a screenplay. He should know, because besides being a visual artist, Canole is a screenwriter, photographer, sculptor, actor, didgeridoo player, and former scientist, among many other things. Seeing the La Jollan polymath create his work so non-chalantly while conversating with friends and strangers at a busy coffee-shop only adds to our astonishment at his charcoal drawings and the fiery souls that peer out from them. So, we were compelled to bother Canole in order to quench some of our curiosity about him and his work. Our interview with him follows below. YowzerYowzer: You are famous for your conversations. If we've heard right, you broke a record for the longest continuous conversation. Is that right? Christopher Canole: There was no record. One day at the Pannikin in 1980, we wondered if the art of conversation was dead. So, I decided to stay up for 99 hours to see what happens when a conversation lasts that long. Two hundred people signed up for half hour sessions all day and night. Sort of like my half-hour conversations each day I draw. YY: Record or no record, 99 hours is pretty intense! CC: We adjusted the time for restroom breaks. YY: Still. So, what did you end up taking away from the experience? CC: Dump the ego! If you want to have great conversations, leave your ego at the doorstep. Use you knowledge and insights to grow a conversation, not to cut your guest to shreds or to show off your intelligence or dogma. This year my new motto is “I don’t know”. YY: Wise words. The reason we ask is because your drawings seem very conversation-oriented. They are created during conversation, and they seem designed to spark questions and story-telling. Was that the intention? CC: I love using the drawings as a way to meet new people and share stories. Several of my drawings are interpretations of scripts I've written. I began drawing again last May, after 30 years, as a part of my application for a Sundance Director’s Fellowship. Da Vinci and Einstein were drawn around 1980. All the others have been drawn within the last year. YY: How do you get your pieces to evoke such emotion? I mean, it's clear that your work is not just a matter of excellent hand-eye coordination. If I remember right, you do research on each piece, reading background material, searching through multiple images for ideas. Do you have any words to describe how all of that is preserved in your drawings? CC: Like my script-writing, the quality is fleshed out in the line. As I draw, I imagine I have the live person sitting in front of me. Sort of like the beginning stages of love, when you can stare into a person’s eyes for hours and hours. There is always a moment when I see the skin move on the paper. I believe this is why I began drawing again after decades of not picking up a charcoal stick. Writing screenplays is the same driving force…trying to capture emotion in a “line” of dialogue or a gesture. A drawing is not like a 1/125 second photo which can capture only one angle. I study multiple angles of a face to see which details best define a person. A tiny mole on a smile can draw your eye to seeing things you would not focus on with a photo from an angle that did not show the mole. To me, a pencil line on a drawing or a line of dialogue are the same, each further detail who a character is. YY: We love your Da Vinci! It's great, in large part, because of the wisdom and mystery that comes through. This was your first drawing, wasn't it? CC: Da Vinci is one of my oldest, circa 1980. He has been an artist who inspired me back when I was a Physics Pre-Med student at UCSD in the 60s. He is one of my heroes for being an artist and scientist. 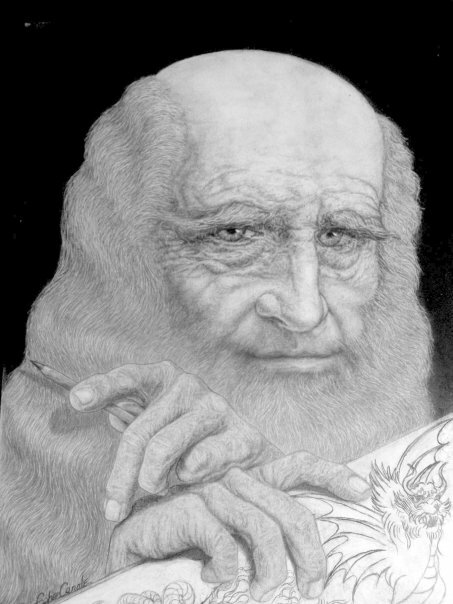 The drawing is based on his self-portrait. The hands are mine. Many people claim the Mona Lisa is based on his drawing, and in my drawing people tend to see my eyes in his. For me, the very nature of art is my form of immortality. YY: Well, that makes sense since your drawings are helping to keep his legacy alive. The drawing compliments your play titled Pen Dragon. Would you tell us what that play is about? CC: Pen Dragon is about a teenager living in the margins of life who inherits Da Vinci’s drawing kit, and everything he draws comes true for everyone except himself. It's a mix of the Merlin legend with Da Vinci’s pen being his Excalibur. Jeremy Cox has agreed to pen the graphic novel if it gets picked up. YY: Your take on Einstein is equally refreshing. Would you tell us what your idea behind it was? 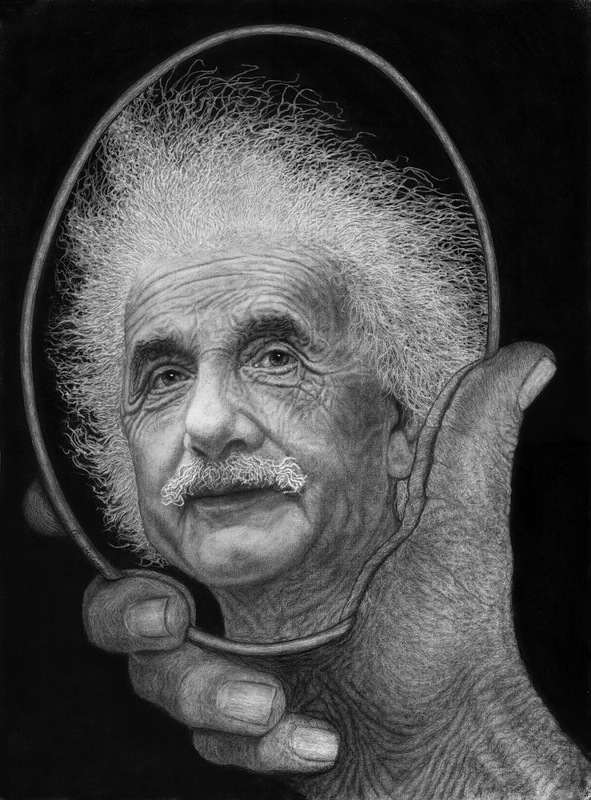 CC: If you stand in front of a glass-framed version of the drawing, your eyes become Einstein’s eyes. As a physics student, he revealed to me how to think about the universe. It angers me that so many people treat science as just a different interpretation of the universe. My eyes as an artist were first opened as a scientist. YY: Would you elaborate on why science deserves to be understood as the foremost interpretation of the universe? And what was your Einstein play about? CC: My specialty was laser physics for medical usage. At the time internal organ surgery was the future, lasik eye surgery did not exist. As for science being my guide to the universe, it is because science is not bias. For me, science is looking at the universe the way every living thing, other than humans, relates to the wonder of the universe: accepting and appreciating everything as it is, not as some human-like gift from a supreme being. Don’t get me started on the arrogant ego of most anti-science groups who only care about making sure humans abuse everything around them for their own pleasure. For me, science is a magnifying glass, not a set of blinders or false filters. Einstein's theories are the core to my script Count Her Clock Wise, which is about a man who lives day to day, backwards through time, seeking love. YY: Would you tell us a bit about Frida? 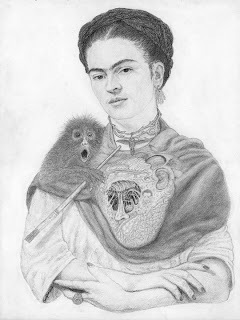 You pulled the different elements of the drawing from some of Frida's paintings? So, where did the monkey in the image come from? And where did the heart come from? 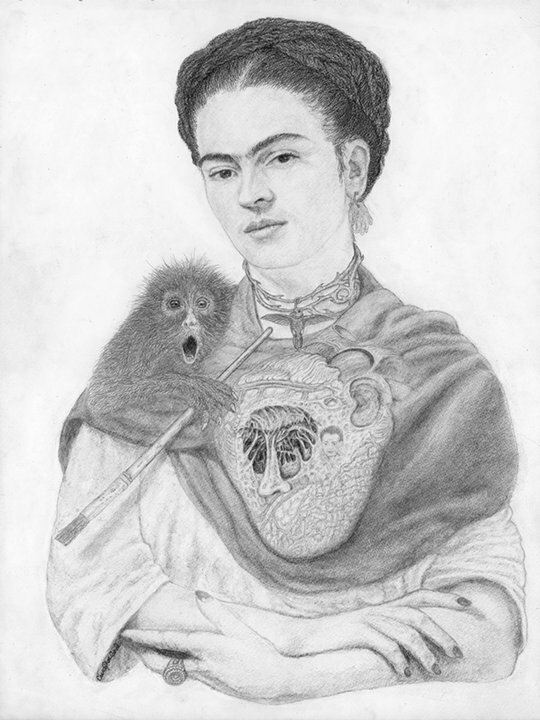 CC: Ask any female artist who inspires them and Frida Kahlo will come up more often than anyone. I love all aspects of her life, which I included with many of the icons she used in her self-portraits. The monkey was her pet. She also used the open heart often, and I loved remembering my time as a heart technician for the Nina Braunwald “Starr” heart valve, when I first discovered I could draw. YY: What is it that interests you about Kawabata? The paper swan calls to mind Kawabata's book Thousand Cranes. Is that the reference? He comes across as a very sensitive and passionate man. CC: I drew Kawabata, like all my drawings, for charity, this one for the tsunami victims last year. My PHd literature thesis was on Yukio Mishima, a close friend of Kawabata. The photo was by Karsh. 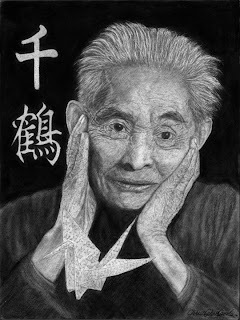 Kawabata's book “Thousand Cranes” set into motion many life lessons that I’ve since seen take form in reality. YY: We don't think people have to admire Obama to admire your drawing of him. It's interesting to remember how the days before his election seemed unreal, even to many of his ardent supporters, because aside from his politics, electing a man with more melanoma and some African ancestry seemed amazing, and was a small step in the right direction for this country. What can you tell us about your drawing? CC: I drew Obama after my short script, “Barack-O-Lantern”, won many awards at film festivals. The script recounts true events at the Pannikin on Halloween, just days before the election. The drawing was done as a reminder that we need to do more than just “vote” for our President after the election. 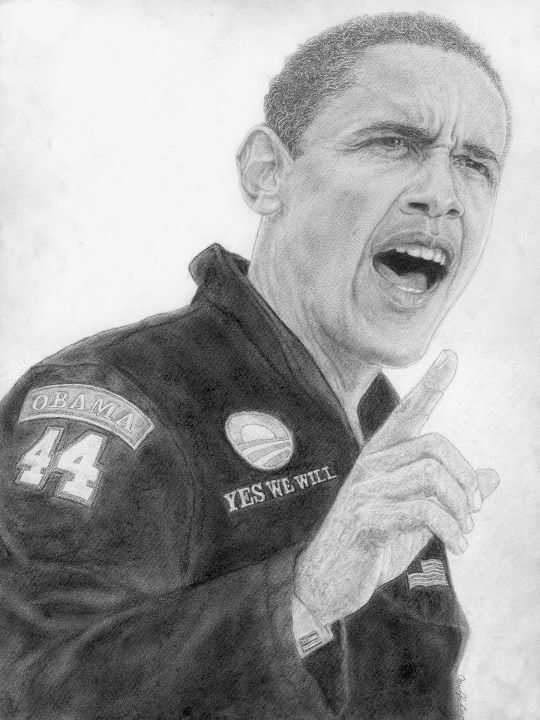 I drew him more like a sports hero with the more determined motto “Yes We Will.” President Obama wrote me a wonderful letter after he received the drawing. YY: That's so cool! For us, it's that sense of fiery determination that makes this drawing a winner. You've also spent quite a bit of time in photography and sculpture. 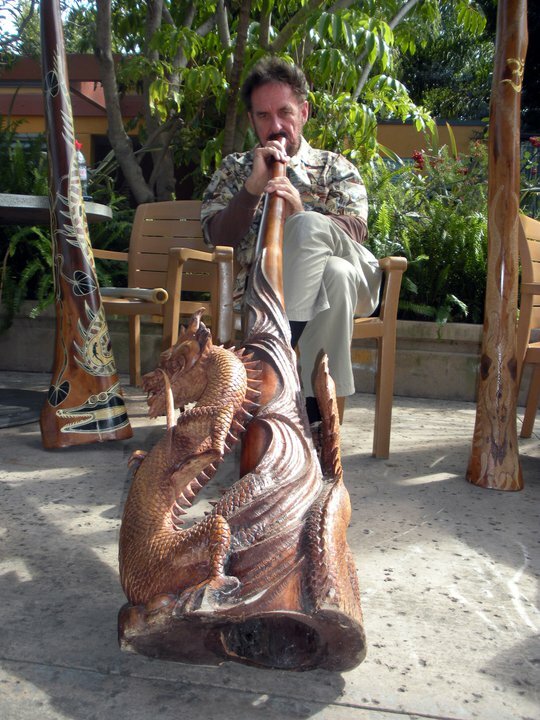 What can you tell us about the didgeridoo you carved? It's such an intriguing instrument, but how did you come to carve your own? CC: While working on the mini-series The Ring in Prague, I dated the first celloist for the Czech Philharmonic, and she insisted I learn a musical instrument. I foolishly thought the didge would be easy. We used to play in cathedrals in Prague together to the surprise of many late night church goers. YY: What projects, if any, do you have on the horizon? CC: The horizon changes for me every day. I will continue drawing, having learned it is the best way to meet people and keep my eyes open to the world. I have a calendar on my wall as a count down to my 100th birthday, so I have 12,724 days [from date of this article's posting] to gaze upon that horizon wondering what tomorrow will bring. Now, I am writing a script based on the months since I rekindled my drawings last May. YY: Thanks so much for your time, Chris! If you wouldn't mind one more, we've got one. You're certainly doing your part, but is there any way you see that San Diego could further grow in art-making and art appreciation? CC: It takes money to generate more art in our community. Our city has a long history of wasting public funds earmarked for the arts dating back to projects like "City Gates". Our colleges and universities produce great artists but grade and high schools keep cutting funds. The 1% in our community could do so much more by simply buying local art. The Pannikin has helped show more good art than most galleries as a coffee house. And my "Dollar A Day Art" rental of prints is my own effort to get the ball rolling. YY: Great Scott! Thanks for your time and for sharing your work, Chris. CC: Glad to help...and I appreciate you getting out the word on my art.